Have you always wanted professional home kitchen? If you cook and entertain regularly, having the perfect space to do so is incredibly important. The kitchen is often the center of the home and making it everything you’ve ever wanted and keeping it organized is sure to be is a treat you deserve. While we don’t doubt your ability to mix up an amazing cake, having a “chef’s kitchen” or a “professional home kitchen” can sure make the process a lot easier. These kitchens rely on both professional grade appliances and the functionality of a restaurant’s kitchen. Professional home kitchens can contain a lot of fancy bells and whistles, but there’s really just a few things that really make it a professional kitchen. These Frigidaire professional grade appliances are currently for sale at Abt. Professional grade appliances take up more space and they cost a little bit more, but they provide amenities that really are worth it, if cooking is your thing. Remember: functionality is key, so don’t overcrowd your kitchen. But things like two stacked ovens, are probably worth it. Let’s say you’re hosting a dinner party. Two ovens would allow you to cook a casserole and a cake at the same time. Make sure to adapt the appliances you pick to how you use a kitchen. If you make pancakes every Sunday morning, make sure your gas range stove has a griddle. If you love baking bread, consider investing in a proofing drawer. If you rely on a cup of coffee every morning, buy the built-in coffee machine of your dreams. Whatever you get, make sure that it’s something you will actually use. The two sinks in this kitchen dramatically increase it’s functionality. 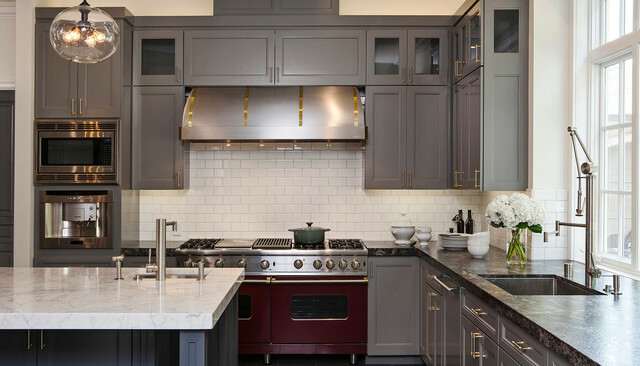 Kitchen design featured on Houzz by Jules Nolet. When possible, install two sinks into your kitchen. Now, it may seem excessive, but think about how fast a sink can fill up with dishes while you cook. The larger sink can be fully dedicated to housing your mess of dishes, while the second one can be functional in the moment. That way, you’ll have a nice clean sink to rinse of vegetables in. As for faucets, think about installing single lever or touchless faucets. That way you can easily turn on the faucet with your elbow when your hands are covered in flour from the delicious pastries you’re making. And while we’re talking about faucets, consider installing a pot filler over the stove. It will seriously increase the efficiency of boiling water, especially when there are multiple people working in your kitchen at once. Open shelves make pots and pans incredibly easy to access. This kitchen was featured in House & Home in July 2013, designed by Laura Irwin. Professional kitchens rely on open shelving. It allows chefs to quickly and efficiently grab whatever they need. But we know open shelving isn’t for everyone. If you opt out of open shelving, that’s okay. Consider installing push to open kitchen cabinets. They will allow you to open up a cupboard while with your knee while you’re busy chopping vegetables. Remember, accessibility is key. If it’s not easy to get to, you probably won’t use it. This kitchen mixes rustic wooden features with the functionality of stainless steel. Design by Sage Homes. First off, having plenty of space is important. If you don’t already have an island, consider installing a moveable cart to use as an extra workspace. You use your countertops for nearly everything, from prepping ingredients to displaying a final product. If everything is cluttered it’ll make your life a nightmare. Make sure the surface of your countertops are hearty. Not being able to put a hot pan on your countertop is a serious no-go. Most professional kitchens rely on stainless steel countertops. Not only are they heat resistant, they are also stain resistant (what a plot twist). Now, if you’re not wild about the look of stainless steel countertops, check out our list of the top countertops that aren’t granite, for some great alternatives. With this open floor plan, you can easily chat with guests who are sitting by the large island. Home design by Webb & Brown-Neaves. While the kitchen matters, remember why you want a nice kitchen. An open floor plan will allow you to chat with your guests, while you’re whizzing up dinner. Even if the house wasn’t built with an open floor plan in mind, there’s ways you can increase the accessibility of your kitchen. Adding a few chairs at one end of the island will allow guests to sit and chat (and sneak bits of meals, for a good old fashioned “test” to “make sure it tastes okay”). And if you have enough space, allowing a gap between kitchen walkways can let multiple people easily work together in the kitchen. Ready to find a house with a professional kitchen?